Who’s ready to bust some ghosts? Join the odd-ball gang of scientists turned ghost fighters in this exciting online slot machine. With 40 paylines and a handful of game features, the Ghostbusters Slot will keep you entertained while winning real money online. 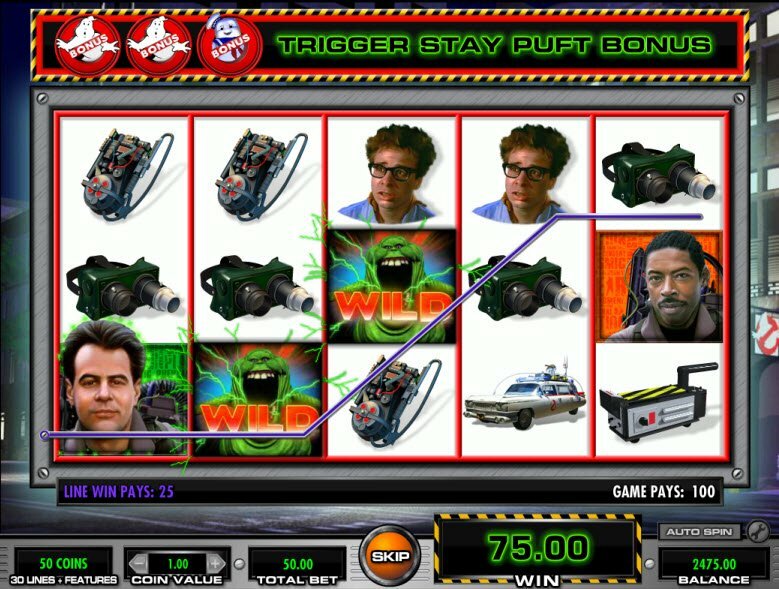 Based on the classic 1984 film starring Dan Aykroyd, Bill Murray, and Sigourney Weaver, The Ghostbusters Slot Machine consists of 5 reels and a whopping 40 paylines. Game reels include your favorite characters from the movie including Slimer and the Stay Tuft Marshmallow Man. Reel icons also include the Ghostbusters gang in full regalia. Look out for images of the ghost hunting gadgets and gizmos. The game features decent quality graphics that animate and light up during winning combinations. The graphics aren’t the best in the business, but they effectively pay tribute to the classic film. While the reels spin, enjoy the movie’s theme song playing in the background. 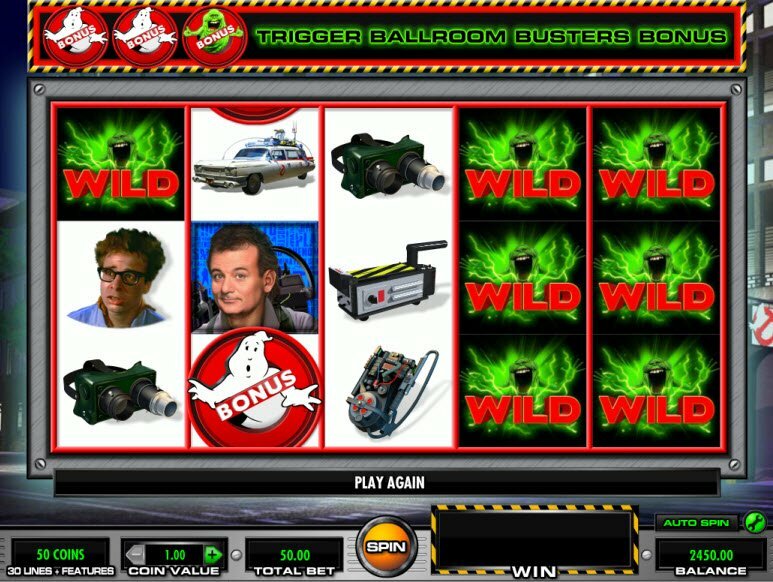 The Ghostbusters Slot is bursting with entertaining game features. The slot machine contains 4 Mystery Features called the Multiplier, Wild Reels, Extra Wilds, and Cash Award Features. is bursting with entertaining game features. The slot machine contains 4 Mystery Features called the Multiplier, Wild Reels, Extra Wilds, and Cash Award Features. The Multiplier gives you the chance to earn a 2X to 5X Multiplier to multiply all line wins on the current outcome. During the Wild Reels Feature, 1 to 3 Reels are slimed and turn entirely Wild. In the Cash Award Feature, you can earn a random cash prize that may be 50 to 1000 times your coin value. During The Extra Wilds Feature, 1 to 4 Reel Positions are initially turned into Wilds. Any positions sharing a corner or edge with an initial Wild may also turn Wild. 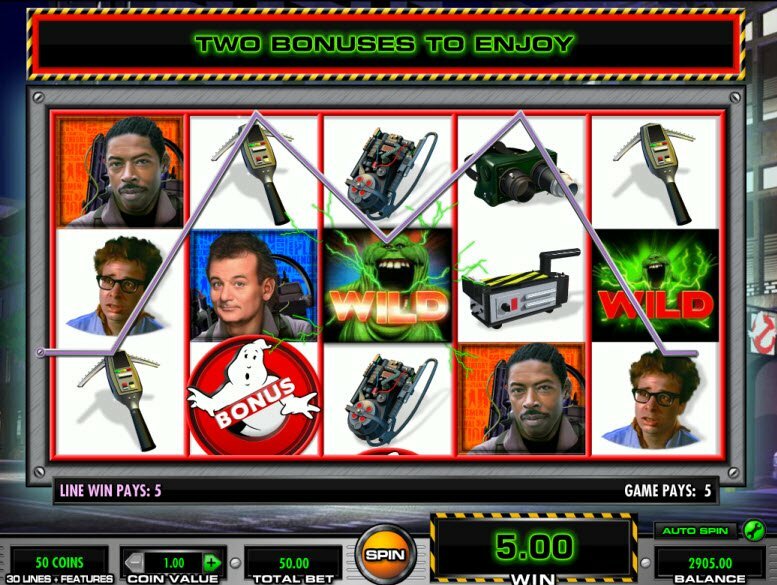 In addition, the Ghostbusters Slot Bonuses feature not one, but two Wild Symbols. Since the Wild Symbols substitute for almost all other symbols, you get a much higher chance of winning. On top of all of this, a combination of two Ghost Bonus Symbols paired with a Slimer Bonus Symbol trigger the Ballroom Busters Bonus. During the Ballroom Busters Bonus, you use 5 proton shots to try and uncover any of the 6 ghosts hiding in the ballroom to win prizes. A combination of two Ghost Bonus Symbols with the Marshmallow Man trigger the Stay Puft Free Spins Bonus in which the game reels take on a whole new look. You also have the chance to win 8 Free Spins. After any free spin, the win meter may open and take in a marshmallow, paying a value of 50 to 1000 times the bonus triggering coin value.